Celtic kept their hopes of reaching the Europa League last 32 alive with a dramatic victory over RB Leipzig at Celtic Park. Knowing defeat could eliminate them with two games to go, Kieran Tierney put the hosts ahead early on. 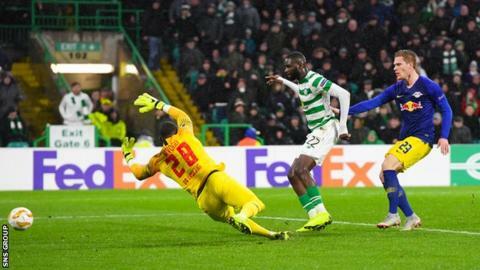 Leipzig’s Jean-Kevin Augustin equalised with a header on 78 minutes but within 60 seconds Odsonne Edouard struck to give Brendan Rodgers’ men the win. Attempt missed. Filip Benkovic (Celtic) header from the centre of the box misses to the left. Assisted by Callum McGregor with a cross following a corner.